So even though Halloween is tomorrow, if you've been out I am sure you've seen all the stores all decked out in thanksgiving, Christmas and new years style! When it comes to fashion, we are always a season ahead, right ladies? I've been planning our family photos and looking for the ideal outfits for the kids... I always go by what I want them to wear first and then what Dave and I will wear. This time around I found the cutest pieces at Gymboree, from hats to purses and the best little shoes for both Ben and Emme. 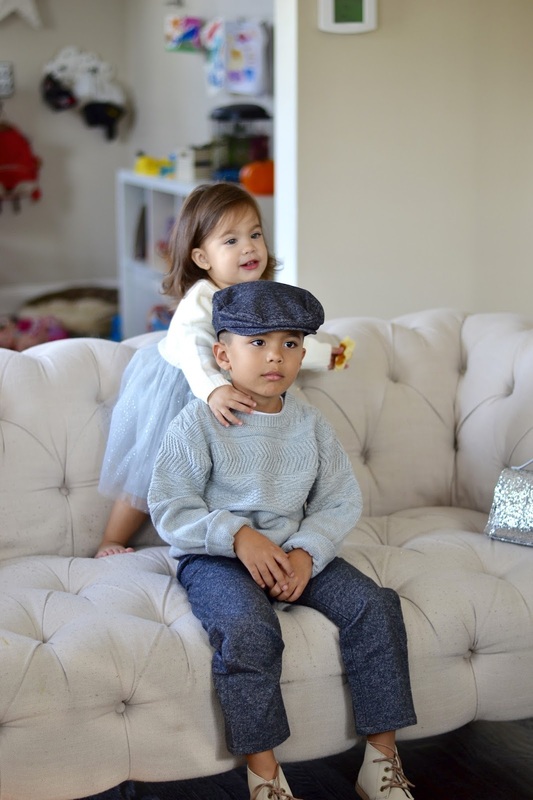 Here are some photos of the kids trying on one of their family photo outfits! I can't get over their hats, they truly add the cherry on top! This last picture of the kids cracks me up... This is a total "reality" moment versus the cute picture perfect expectations... Emme had a piece of bread in her hand the whole entire time and Ben was too interested in the movie he was watching! I adore these kids and they looked so cute in their Gymboree gear. I love that Gymboree has comfortable, stylish pieces that I can afford. The kids are wearing clothes provided to me by Gymboree, thank you for supporting my blog. As always all opinions are my own.